This week is British cheese week so what better what to celebrate than baking some local Somerset cheese. Top that with some sweet tangy caramelised onions and serve with some crusty gluten free bread and you have a real treat on your hands. Not the healthiest meal but it was definitely worth the calories for the yummy taste. Heat a wide think bottomed pan over a medium heat and add the olive oil. When the oil is hot add the sliced onions and season with the salt, stir to coat them in the oil and spread them out in the pan. Cook them for about 15 minutes stirring occasionally to make sure they don’t burn. If they start to burn or stick to the pan you can add a little water. Whilst the onions are cooking pop the brie in the oven. I baked mine in a cheese baking dish but you can also bake the brie on foil or on a baking tray. Create a shallow pan with the foil if using a baking sheet to stop it escaping. Cook the brie for 15 – 20 minutes until the edges brown and the cheese is molten. The onions should be starting to caramelise nicely. Turn the heat down a little, add the sugar and continue cooking for a further 10 minutes stirring every couple of minutes. Add the balsamic vinegar and cook for 5 minutes. 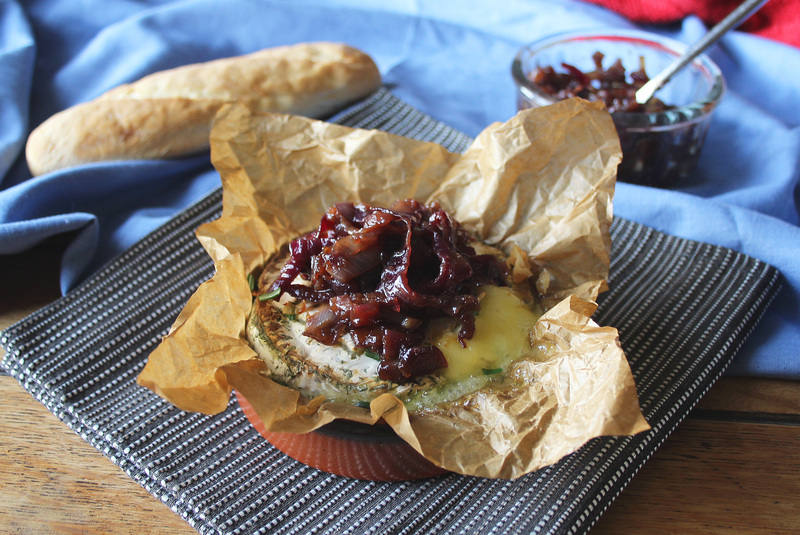 Remove the brie from the oven and top with the caramelised onions. Serve with some crusty gluten free bread, celery or gluten free bread sticks for dipping. Thanks It sure was! I LOVE cheese so this really was my kind of treat. Love baked brie. Love caramelised onions. I’m hungry!! Your photos aren’t helping with my hunger either, they look amazing. Thanks! It was really delicious, definitely one I would make again. Thanks for inviting me to join #FoodYearLinkup I love to share my recipes with people. Thanks. You have to try it, It’s really tasty. I think they would also go really well with baked Camembert… yum!